As breeders select for more productive qualities in poultry breeds, other characteristics that may be useful in different conditions can sometimes be lost. Faster growing broiler breeds are less able to cope with a varied diet than those with lower growth potential, according to this study by Jana Pauwels and colleagues recently published in PLOS One. The feeding of industrial broiler chickens is often criticised because of the extensive use of feed sources which are neither socially nor ecologically sustainable. The diet of intensively-raised broilers consists mainly of maize, soy and wheat, ingredients that could also be used directly in the human diet. Alternative ingredients, less sought after in the human diet, have been proposed for use in the chickens’ diet. Changing the ingredients, and therefore, the nutrient composition of feed intake by commercial fed as well as scavenger chickens seems like an obvious solution. The low productivity of scavenger chickens in developing countries is often blamed on the lack of concentrated diets. The diet of scavenger chickens contain, for example, crude fibre levels up to more than 100g/kg dry matter. While Jørgensen et al. reported that broilers (by fermentation of three different non-starch polysaccharide (NSP) rich substrates: pea fibre, wheat bran and oat bran) extract a maximum of 42kJ/d, representing only 3 to 4 per cent of the daily metabolisable energy intake, hereby confirming the widely accepted idea about the low energetic value of NSP-rich diets for poultry. Solving the problems for both the industrial and the rural chickens is especially interesting since chickens are a widespread food source around the globe. The United Nation’s Food and Agriculture Organisation (FAO) estimated that there were nearly 22 billion living chickens in 2012. This is the equivalent of more than three chickens per person. Moreover, in developing countries, chickens are often the main source of animal protein through their meat and eggs and most of these chickens stem from indigenous, slow growing, breeds. The low productivity of scavenger chickens in developing countries leaves much to be desired. In this study four different chicken breeds, with growth rates between 30 and 60g/d, were used to plot a range in growth rate between the slow growing scavenger chicken on one side and the fast growing industrial broiler chicken. Two diets were used to feed these chickens: one was a commercial industrial diet and the other was based on reported scavenger diets. The commercial diet contained mainly wheat and soybean meal, whilst the scavenger diet also contained a mixture of other components including mealworms and lucerne. The average daily gain, average daily feed intake, feed conversion ratio and the length of the tarsometatarsus were registered for all breeds on each of the diets. The researchers also collected some faeces samples to determine the digestibility of the diets, and measured different diet characteristics such as fat content, fibre and protein. The aim of the study was to monitor the effect of the scavenger diet in relation to breed-specific growth rate. The four different breeds of chickens showed the expected distribution of growth rates, in accordance with their different genetic growth potentials. The faster-growing breeds showed slower growth rates when fed the scavenger diet compared to when fed the commercial diet. However, the slow-growing breeds showed little to no difference between growth rates on the commercial or scavenger diets. Chickens on the scavenger diet showed a higher average daily feed intake, with feed intake measuring higher for the faster-growing chickens on both diets. The scavenger diet increased the feed conversion rate. The slower-growing chickens were able to increase their feed intake on the scavenger diet by up to 40 per cent, which is how they were able to maintain similar growth rates to on the commercial diet. Whilst the faster-growing chickens always had higher bodyweights than the slower-growing breeds, the faster-growing birds were unable to increase their feed intake by enough under the scavenger diet to keep their weight gain the same as when fed the commercial diet. The scavenger diet showed lower fat and protein digestibility than the commercial diet, which can be explained by the high amounts of non-starch polysaccharides and a lack of enzymes to break them down. The commercial diet contained added enzymes. The higher fibre content of the commercial diet may also have 'enclosed' nutrients in the feed and prevented chickens from digesting them. 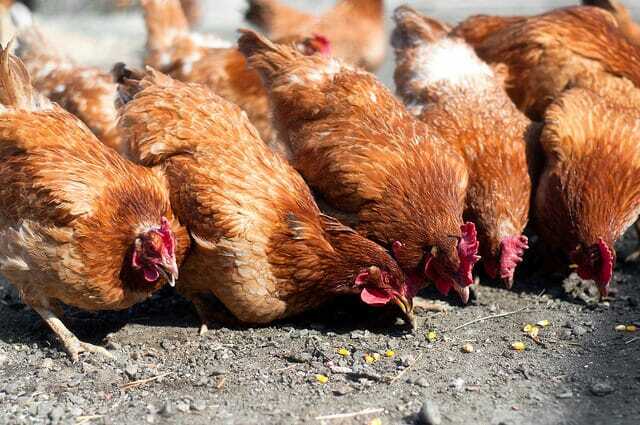 In addition, the higher fibre content and the higher feed intake could have caused the higher amounts of manure observed deposited by the chickens on the scavenger diet. The authors said that although the increased feed conversion rate, as seen in the scavenger diet, is generally considered an economic disadvantage, the study authors said that this perspective depends on the environment the chickens are raised in. For example, in a rural situation, where a scavenger diet can (partially) be found in the environment and is available at libitum, the results suggest that scavenging chickens might achieve the same bodyweights as when they were fed a commercial diet. Still, factors such as disease, water availability and housing must be controlled. 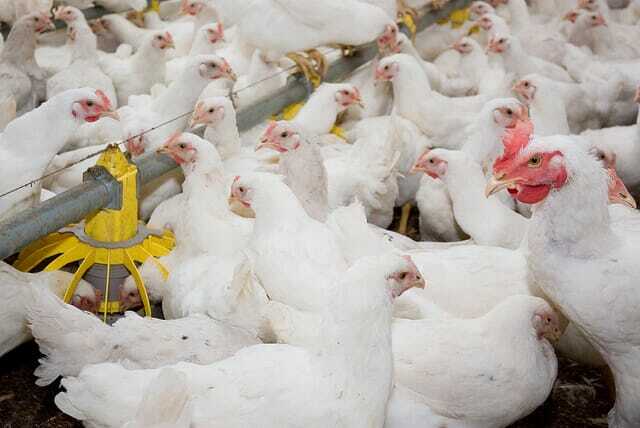 In addition, chickens that are able to find (a share of) their feed in nature will minimise the competition between humans and livestock for feed/food resources. However, the results of this experiment also indicate that industrial broiler breeds will not be able to increase their feed intake sufficiently in order to achieve the same bodyweight on a diet with lower energy and nutrient density (such as the scavenger diet in the present study) as they would do on a current commercial diet. The authors concluded that the current selection criteria for chicken breeds might need to be reconsidered, as the advantage of selecting more productive chickens on a commercial diet rapidly decreases when a lower quality diet is provided. For slow growing chicken breeds - such as the ones used by smallholders in developing countries - the added value of using a concentrated diet versus a typical scavenger diet is low. Their differences in growth performance are caused more commonly by differences in feed intake than by differences in digestibility. You can view the full report, author list and references by clicking here.